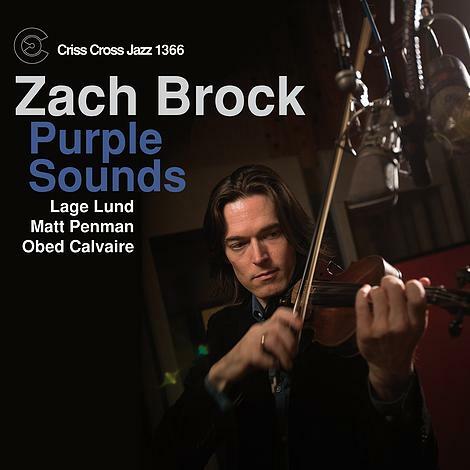 Violinist Zach Brock follows up his 2012 Criss Cross debut Almost Never Was (Criss 1349) with the remarkable Purple Sounds, a heartfelt and virtuosic homage to the great violin-guitar partnerships of jazz history. Shifting from the piano-based quartet setting of the previous disc, Brock opts this time to showcase guitarist and fellow Criss Cross artist Lage Lund, whose effortless contrapuntal approach and beyond-belief soloing chops elevate the session from note one. They're joined by an energized first-rate rhythm section with bassist Matt Penman and drummer Obed Calvaire. Though the set begins and ends with a Brock original, the artistic emphasis on Purple Sounds is not that. 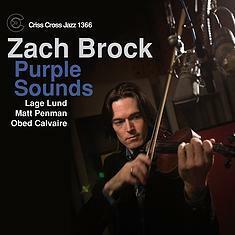 Brock's intention is to highlight and transform a wealth of material associated with violin masters, particularly those whose work with guitarists subtly altered the jazz landscape. Touching on composers from Charlie Parker to Frank Zappa, or violinists from Stuff Smith to Jean-Luc Ponty and the often overlooked Zbigniew Seifert, Brock displays a remarkable command across the jazz spectrum.